Yep, after paddling to South America and having put some 5000km on the much-anticipated Dak Dak four-door ute, I can say that all other makes of work and recreational utes available in Australia had better watch out and step up their safety and performance presence if they are to stay in this crowded 4WD segment. When the Amarok arrives in Australia, it’ll be adorned with some mighty heavy-weight gloves…and it’ll be swingin’ plenty of blows to capture its fair share of the market. To VW’s credit, we didn’t just gently stroke their pride and joy new utes around manicured dirt roads and bitumen freeways – no siree; they allowed us to take part in the mighty Dakar Rally in South America. 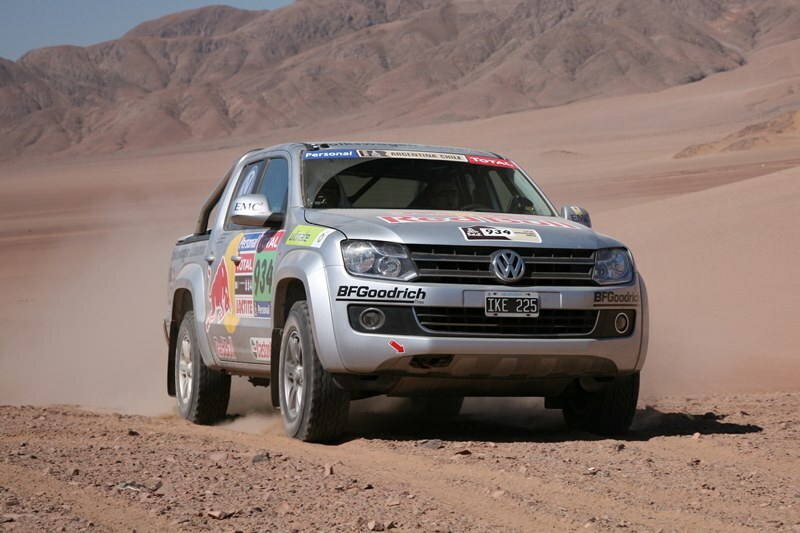 At the end of the Dakar Rally, the Amarok I was in control of showed no signs of creaks, rattles or stress of having been driven through mud, dust, kilometre-high sand dunes, rock strewn tracks and countless hours of high speed bitumen – day in day out. After a wash, the only indicator of its history was the odometer and history making photos of its incredible journey. The only let down was the (as expected) tight-lipped German Volkswagen officials, who would neither confirm nor deny exact specifications for the Australian market no matter how many times they were asked. "wir wollen dir nichts… oder wir werden den Kopf zu entfernen", which I thought was an amusing reply until I was told by a German speaking journalist that it meant “We will tell you nothing…or we will remove your head”… I didn’t ask for specs again…and I stopped giggling! Although there were a number if different spec’d vehicles on the Dakar, the vehicle we unwittingly procured was the most likely and closest version we will get in Australia. The 4-cylinder 2.0 litre common rail twin turbo (yep, count TWO turbos), six speed manual gearbox, high and low range transfer case, complete with rear diff lock, electronic traction control (ETC), Anti Slip Regulation (ASR) and off-road mode switchable ABS, which lessons the effect of the ABS while off road, will make the Amarok a fair dinkum contender as one of the best recreational offroad utes available in Australia. This diesel engine is expected to produce 120kW of power and 400Nm of torque and conforms to Euro 5 emissions standards. While some may argue that the 2.0 litre capacity is too small, take it from us the dual turbo setup makes it one hell of a performer. To take the twin turbo design further: at lower revs, the smaller turbo is working (aids in low rev power with no turbo lag), then at higher revs the larger turbo literally takes over to further enhance the engines performance. Via the tacho, we noted 1800 RPM @ 100km/h in sixth gear, 2000 RPM @ 110 km/h and 2200 RPM @ 120km/h (the maximum speed rating were we travelled). A fuel tank of approximately 80 litres (we watched on as they were re-filled at a few service stations), combined with dashboard readouts of as low as 8.0 L/100km will see it a great long distance hauler. The six-speeder slotted into all gears easily and directly. The centre unsprung position being in line with third and fourth slots, while a light push against spring-loaded tension allows access to first and second on one side and fifth and sixth on the other. A vertical depress and push left and forward accesses reverse gear – again easily and positively. Clutch feel combined with accelerator throw is all very car-like; it’s light, easy to use and well endeared to long hauls as well as peak-hour rat races alike. Front brakes are disc, while rears are drums. The Amarok has a separate ladder-frame chassis with solid rear sprung-over axle with leaf springs combined with front independent Macpherson strut suspension. Steering was direct, well proportioned at all speeds and provided confidence inspiring driving through all terrain – slow or fast. Long distance touring was a breeze with the 6-speed manual gearbox. Even in top gear (with those two turbos to choose from) accelerating and overtaking slow-coaches and maintaining (and even increasing) speed up hills was surprisingly easy. While we didn’t tow trailers, it’s expected towing duties would be on par or better than most other utes available in Australia, with the only exception of perhaps a few extra down-changes and not fully utilising top gear while in hilly highway situations. Body and suspension feel very tight and stiff, which equates to excellent on-road steering and suspension manners. There’s no notable flex or rear-end movement while driving over undulating or irregular surfaces. I’d expect the final product to be much more compliant, soft and comfortable than the utes we drove. That’ll go well for passenger comfort and general user friendliness, but not for supreme performance…but that’s fine with me. Driver and passenger airbags will be available, but most likely not curtain or knee variants. 17 inch alloys will be standard fair on this higher specced ute, while there is a possibility 16 inch steelies will be fitted to base models. Load-wise, the Amarok is expected to be a 1-tonner and be able to tow 2800kg (with electric trailer brakes), making a great all-rounder for the tradie and tourer alike. We carried two spare wheels in the ute tub, plus a small compliment of recovery gear and luggage for the three occupants; certainly not a full load, but enough to settle the rear leaves. Ute tub size will accommodate a standard 1200 x 1200 pallet, so that’ll make all those tradies happy that can’t quite fit a full sized pallet into their current makes of 1-tonne utes. A bit of pacing and hand-spaning sees the Amarok being slightly longer and wider than current competitors – a good thing for towing, carrying and offroad stability. Ground clearance is also impressive with space for more than two cans (at 125mm each) standing on end under critical components. Again, exact dimensions will be forthcoming later. 4-door bodies, diesel engines and manual boxes are the initial variants bound for Australia, although single cabs will get a look in soon after. Here’s hoping we get an ‘extra-cab’ version as they represent an excellent two-up working and touring option, same goes for an auto (with tip-tronic-style selector) gearbox option. There is seating for five, with front and outer rear retractable seat belts, but at this stage the centre rear belt set-up is unsure – hopefully a full retractable lap-sash belt. Rear seat space for head and leg room was excellent, as there seems to be plenty of room to play with given the overall package is longer and wider than others. While testing the Amarok, we did get a look at a rear wheel drive version that will most likely get a look into the Aussie market to satisfy builders and the like, plus an all wheel drive version (VW call it ‘4Motion’ as on their vans) with no low range – this probably won’t get a look in over here. There is also a lower output variable vane, single turbo 2.0 litre diesel engine that may or may not make it to our shores. Pricing will be…sorry, I couldn’t bring my self to ask the unflinching, straight-faced German VW reps again, given the aforementioned threats of losing my head! That will be provided of course at the Australian launch later this year. Being built in Buenos Aires, Argentina, South America makes this ute a little unique as most others utes are bolted together in Thailand. Let’s hope the dollar conversions, market appeal and willingness to sell combine for a well-priced 4WD. VW has a big job on its hands if it’s to take a large chunk of the ute market place, but having seen first hand the tenacity of their team and the unflinching determination to get it right…watch out those standing in the ring opposite. While the Amaroks we drove handled the terrain with total ease, they did have a few modifications – mainly for our safety and to satisfy race officials given the potential for mishaps during the rally. Some mods enhanced the overall package, but a couple were to its driving detriment! Be sure to clock back in next month for a run down on the customised options we used on the Amaroks during the Dakar Rally.